‘Spaghetti Junction‘ is the intersection of I-85 and I-285 in Atlanta, GA. Thanks to Chris Martin, Brad and df. How on earth do you go about designing those places? The satellite apparently took this picture at about Noon on Saturday, because any other time this intersection is completely packed and unnavigable. 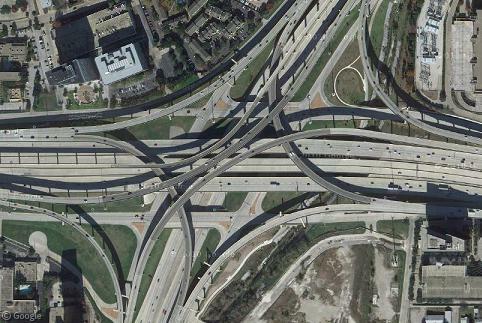 Yeah, the same goes for the i-20 intersection – no way it was taken anywhere near rush hour! That I-290/I-94 interchange in Chicago is the third most heavily trafficked intersection in the nation. That’s great! It keeps the turning radii much larger than the typical cloverleaf. And tons of space to merge! 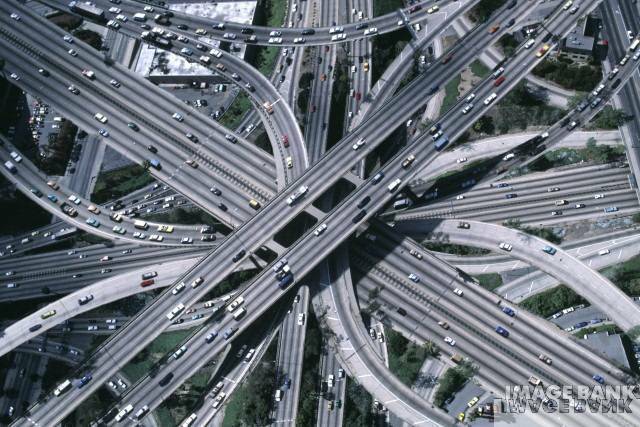 In england “Spaghetti Junction” is Jct 6 of the M6 just north of Birmingham. Not going to get into who-came-first or any of that, but the M6 Jct is quite complex, worth a look? The Spaghetti Junction is the best thing ever. With that said, I still try to avoid driving on it. Take MARTA, it’s Smarta. What you guys might not realize is that the highest points of this intersection have 4 layers of road stacked. I’m not exactly sure how high it is, but I would say the 285S to 85N ramp is pushing 100 feet. Here’s the new interchange SW of Washington DC that joins I-95, I-495 (Capitol Beltway) and I-395, along with several other intersections. You can see them building it now. Take a look at http://times.johanesville.net/galerie/999/intersec.jpg . I don’t know where it is taken and it’s so weird that I’m not sure if it’s not a fake. Isn’t quite as bad, but is actually kinda pretty… I used to drive it to and from college and home. Once, I went into it from the opposite direction and was totally disoriented! This has a good view of Atlantas junction from the ground. just to give you the hieght feel of it, i ahte traveling on it myself. Spaghetti junction has the distinction of not only being a major road junction but it also has a canal and a railway running through and under it. All it needs is a runway and thats the lot covered! Leave it to the Georgia D.O.T. to create something so rediculously complicated. It’s nice to look at though. Also, one can’t help but ponder a fall from the top ramp of 285 to 85 Northbound. For those who don’t know, our Department of Transportation is fond of such traffic-enhancing tactics as changing a road name as much as possible while the physical course of the road remains unchanged. They also have a habit of solving all highway traffic problems by adding more lanes, which means on I-75 North, I can sit in traffic with 8 northbound lanes of stopped cars, as opposed to 6. And, I can sit in a special HOV (high occupancy vehicle) lane, stopped, listening to “2 or more occupants” tell me how to navigate the parking lot we call a highway. In Auckland, New Zealand the problem of linking two motorways in a confined space was solved in an ingenious way. Instead of crossing at right angles both motorways use S-bends to allow them to run parallel, one on top of the other. At Googlemaps te map of Auckland has spaghetti junction almost at its centre so its easy to zoom in.